Foot abscesses or "pus in the foot" are one of the most common causes of lameness in horses, ponies and donkeys, particularly during warm, wet weather. They can be very sudden in onset and are usually very painful. Foot abscesses tend to be caused by bacteria tracking up the hoof wall or under the sole through weaknesses in the white line (where the horn of the hoof wall joins the horn of the sole). Lameness, often to the point where the horse is unable to bear weight. Increased digital pulses- you can feel for these at the back of the fetlock. Swelling of the lower leg as infection tracks up the leg. Some horses may lie down more often to take their weight off their feet. Eventually the abscess may burst out at the coronary band. If you suspect your horse has a foot abscess you should arrange a visit from your vet as soon as possible. It is usually necessary for the vet to remove the shoe to get a good look at the whole foot. They will use hoof testers to pinpoint the area where most pain is elicited and where the abscess is likely to be. From here they will use hoof knives to dig down and open up the abscess tract allowing it to drain. 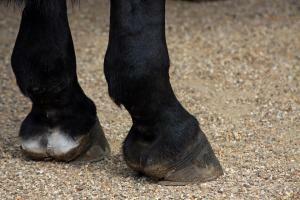 Since pressure builds up in the restrictive hoof capsule this can provide immediate relief. A wet poultice is then applied to encourage draining. It is not always possible to locate a foot abscess in the first instance - in which case the foot should be poulticed for a day or two until it is more apparent. Even after the abscess has stopped draining, the area should be kept covered with a dry poultice until it has healed sufficiently to prevent dirt and moisture re-entering. Hot-tubbing with dilute iodine can help keep the area clean. Antibiotics are not usually necessary though pain relief such as Bute can be given until the horse is more comfortable. If the horse has not been vaccinated against tetanus they should be given tetanus anti-toxin. Most straight forward foot abscesses will resolve within one or two weeks. Hoof supplements may improve horn quality.